This is a terribly simple idea, and a great one. 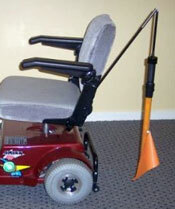 I always supplied safety flags at no charge to my clients when they purchased power wheelchairs or mobility scooters from me as a sales consultant. People who use power wheelchair and scooters are much shorter than those walking and drivers are not used to looking out for them. Safety flags, when mounted on a wheelchair or scooter, are usually about 6' tall and their bright orange colour and flexible design will attract the attention of drivers and help prevent accidents. While brightly coloured and usually reflective seeing them in the dark still isn't easy. Amigo Mobility has designed a battery powered LED illuminated safety flag for use at night that won't easily be missed by drivers. 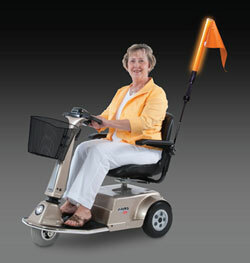 The battery-operated Alert Light (#11432) provides high visibility in both daylight and darkness on POV/scooters, power chairs and even bicycles! After nearly colliding with two different individuals using mobility vehicles, James Wilcox, an employee of Valley Metro Transit System in Phoenix, Ariz., decided to take action. After research proved that far too many people using power-operated vehicles are involved in roadway accidents, some including death. James became determined to help save lives by creating a product that would aid in preventing these accidents. James got in touch with Al Thieme, Amigo Founder and President, soon after. Al saw James' passion and enthusiasm for this product and was excited to help him make his idea a reality. Months of testing and multiple prototypes later, James' passion and drive to save lives was rewarded by the creation of the Alert Light.